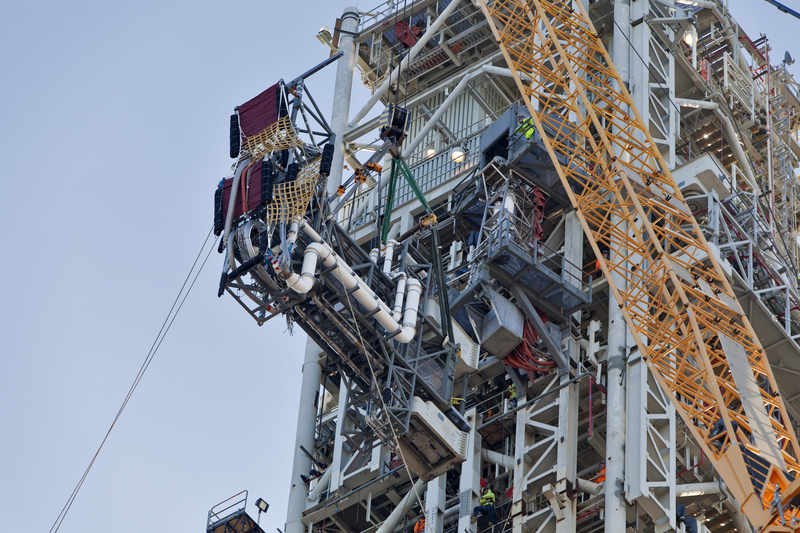 Nearly the last of several large connection lines, called umbilicals, was installed on the mobile launcher at NASA’s Kennedy Space Center in Florida. The umbilical was lifted by crane and attached high on the tower of the mobile launcher at about the 240-foot level, bringing the steel structure one step closer to supporting processing and launch of NASA’s Orion spacecraft and Space Launch System (SLS) rocket. The launcher is designed to support the assembly, testing, check out and servicing of the rocket, as well as transfer it to the pad and provide the platform from which it will launch. This particular umbilical will supply propellants, environmental control systems, pneumatics and electrical connections to the interim cryogenic propulsion stage (ICPS) of the SLS rocket and will swing away before launch. The umbilical also will provide hazardous gas leak detection while the rocket is on the pad. The ICPS is located between the core stage of the rocket and the Orion capsule, and will provide propulsion for Orion while in space and give the spacecraft the big push needed to fly beyond the moon. To install the umbilical, construction workers with JP Donovan prepared the rigging lines and attached the umbilical to a large crane. The ICPS umbilical was slowly lifted up and bolted to the mobile launcher. The entire process took about four hours. With the umbilical in place, workers will install additional equipment on the tower, as well as electrical wiring, environmental control system tubing, hydraulics and other commodities will be routed to the umbilical arm before testing. Tests of the swing arm also will be performed as part of the verification and validation process. Exploration Ground Systems is overseeing installation of the launch umbilicals and launch accessories on the mobile launcher to prepare for the first integrated test flight of Orion atop the SLS on Exploration Mission-1. A pair of tail service mast umbilicals are slated for installation later this year and will be the last of the twenty umbilicals and launch accessories to be installed on the mobile launcher. With this test flight, NASA is preparing for missions to send astronauts to deep space destinations, including the Moon, Mars and beyond.